The Commonwealth Government’s Regional Development Australia Fund (RDAF) Round 2 has recently been announced, however the program’s revised guidelines have created a situation where Council is unable to apply for funding. Council submitted an application for funding under Round 1 of the Commonwealth’s Regional Development Australia Fund (RDAF) for assistance to establish a central transport hub for community buses in Nambucca Heads. This funding application was unsuccessful, and feedback provided on the application included: the project did not cross regional boundaries, there was some risk associated with the project as the land and building had not been purchased for the service (the Council was seeking money to buy the property with the grant itself) and the costings were estimates and not quotes. Following consultation with stakeholders about the process and outcomes of Round 1, the new Round’s guidelines were amended. One change was to have a two-stage process where applicants put in an expression of interest first and only a shortlist of projects would have to put in all the work required for a full application. - The minimum amount which Council could apply for is $500,000. Therefore, Council would have to find a minimum of $500,000 cash in matching funding to be eligible for the grant. Also, the timeframe for the grant is such that even if the financial resources were available, it would be impossible to get Council approval for the potential expenditure of such a large amount of money. Council staff had identified work associated with the Macksville Memorial Aquatic Centre as an opportunity for a grant application in Round 2, however no application will now be made under this program. Council at their meeting on 20 October 2011 resolved to approve the temporary road closure of Ridge Street, Nambucca Heads from Bowra Street to Estuary Lane, between 5.30 pm and 8.30 pm on 1 December 2011 for the Christmas Street Event organised by the Nambucca Heads Chamber of Commerce (NHCOC). The NHCOC have asked for an extension of time for the road closure to allow for setting up and taking down stalls and equipment associated with the event. Council has previously approved the temporary road closure of Ridge Street, Nambucca Heads for the Christmas Street Event. In their application for Activities and Events on Roads the event organisers nominated an event time of 5.30 pm to 8.30 pm leaving insufficient time to set up and take down equipment and stalls associated with the event. The Nambucca Heads Chamber of Commerce has requested Council consider an extended span of hours for the temporary road closure from 3.30 pm to 9.30 pm. Concurrence to the extension has been sought and granted by NSW Police and the Transport – Roads and Maritime Services (previously known as the RTA). No impact on the environment. The event draws large crowds and provides entertainment for the general public. The event contributes to the local economy in a direct and indirect way. At its General Purpose Committee meeting of 16 November 2011 council were presented with a report Nambucca Flood Investigation – Phase 2 Seaview Street, with a number of recommendations for consideration. The minor system is defined as the gutter and pipe network capable of carrying runoff and nuisance flows from minor storms of a 1 to 5 year Average Recurrence Interval (ARI). The pipelines prevent stormwater damage to properties and also limit the frequency and quantity of surface water to a level that is acceptable to the community. • A drainage reserve if it is impractical for unsafe for a road to carry the excess flows. 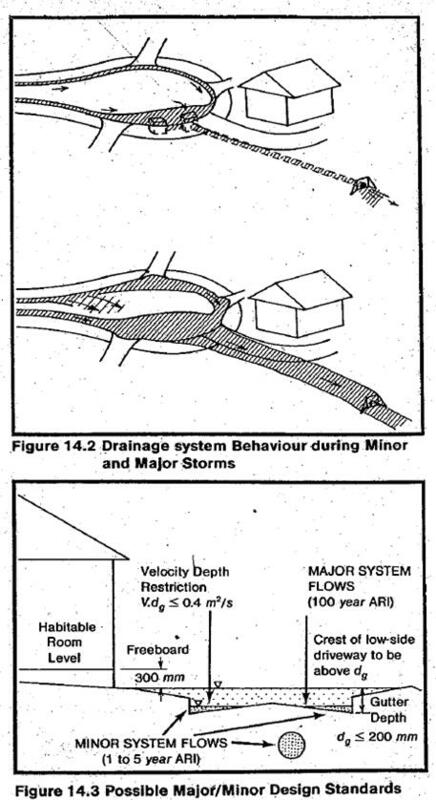 See attached sketch of the major/minor stormwater drainage system. Trunk drains are large capacity channel or conduits which carry runoff from local street drainage systems to receiving waters. They are typically natural or artificial channels located in dedicated drainage easements or right of way. The recommendations do not give rise to any social issues.